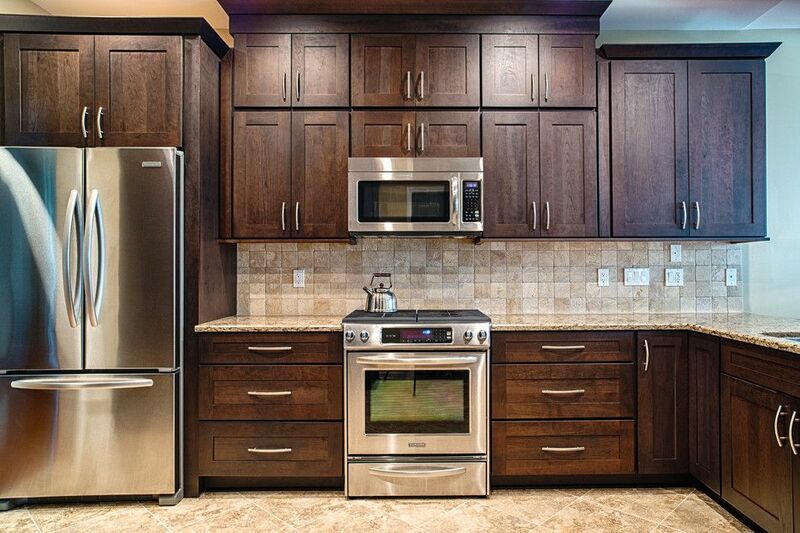 Beginning with the custom cabinets above the refrigerator you have to account for the wood that surrounds the fridge. You start this by measuring around the area because this is a custom job and you want to let the cabinets fit snug onto the appliances. You want to ensure that the cabinet above the appliances is the same size as the appliances and any bottom sectional should match the same width as the bottom. The design of the kitchen should look fluent evenly and have a balanced layout throughout every visual area of the scheme. You also want to understand what the color is going to go in the back splash so you can properly plan what the shade of the custom cabinets will go along with the stone. These customer out of Katy, TX wanted to match the granite with the back splash precisely. Sometimes they will want two neutral colors that complement each other and bring out color variations to let the custom cabinets pop or sometimes let the back splash pop with a sharp color. If the cabinet maker uses the vivid color then you have to create contrast through out the kitchen with the flooring and black splash. With the staggering cabinets that line up flush to the rest of the custom cabinets it makes it so the remodel came off very professional.